Kapiti Island is one of New Zealand’s premier bird sanctuaries. It is home to nationally important populations of little spotted kiwi, kaka, North Island saddleback, stitchbird and North Island robin, as well as other threatened bird species. The island was considered to be free of all introduced mammal pests after rats were eradicated in 1996. However, a stoat was seen there in late 2010, and intensive trapping effort by the Department of Conservation (DOC) resulted in three stoats being killed during 2011. 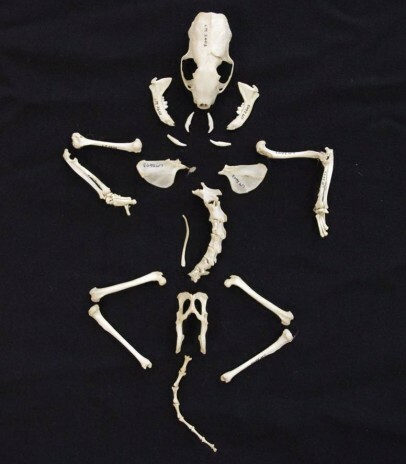 Inspection and analysis of these animals indicate that a pregnant female stoat probably reached the island during 2009, and gave birth towards the end of that year. Trapping and survey efforts continue, and it is unknown whether any stoats are still present. Saddlebacks are extremely vulnerable to stoat predation as the birds not only nest in tree holes, but roost in holes every night. Birds that roost or nest in holes have little hope of escape when a predator comes in through the only exit. 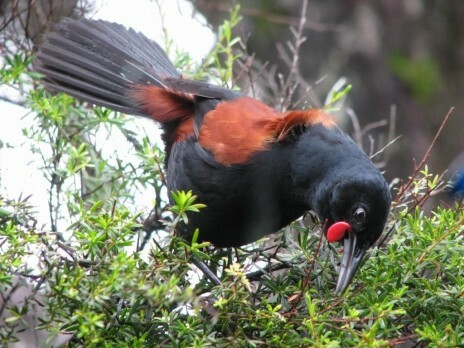 Saddlebacks are also noisy and conspicuous, and so were expected to be the first bird species to noticeably decline if stoats started to have an impact on bird populations on Kapiti Island. Stoats rapidly extirpated saddlebacks from Maud Island and Motukawanui Island when they invaded in 1982 and c1985 respectively. Members of the Ornithological Society of New Zealand (OSNZ) completed 3050 ‘five-minute bird counts’ on Kapiti Island between April 2009 and January 2012. Counts were completed every 3 months during a period completely overlapping with when stoats were believed to be present. Analyses of these counts revealed no reduction in saddleback range or numbers on the island over these 3 years, supporting DOC’s survey results indicating that very few if any stoats remain on the island. It is great news that saddlebacks continue to thrive on Kapiti Island. This can be attributed to the huge effort that DOC staff have made to eradicate the invading stoats. OSNZ established 61 permanent count stations on Kapiti Island in the 1970s, and has undertaken 3-year blocks of counts approximately once a decade ever since. The OSNZ counts were organised by Colin Miskelly (Te Papa’s Curator Terrestrial Vertebrates). 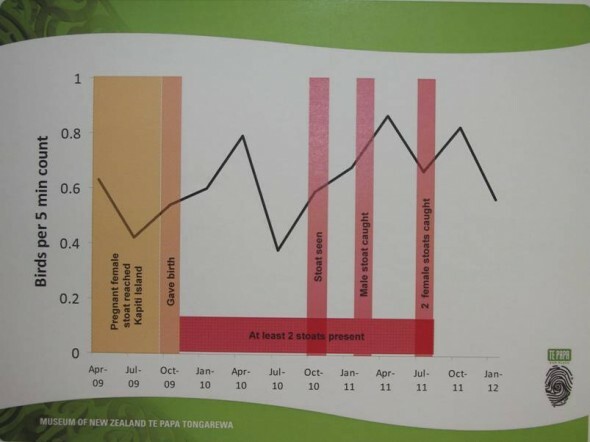 Transport and food costs were met by DOC as part of ongoing monitoring of the ecological health of Kapiti Island. That’s heartening news. I assisted with the Weka capture at Waiorua on the northern end of Kapiti in 1995/96; in preparation for the bait-drop to eradicate rats and other predators on the island. It was a tricky, and dirty, job but well worth it. I remember quietly sitting in the bush watching Tieke (Saddleback) display while foraging along the forest floor. They are beautiful birds and an absolute joy to observe. My family has been associated with Kapiti Island since we first arrived as a part of the Ngati Toa migration in 1823/24, and are still associated with it to this day. Great update, thanks Colin.